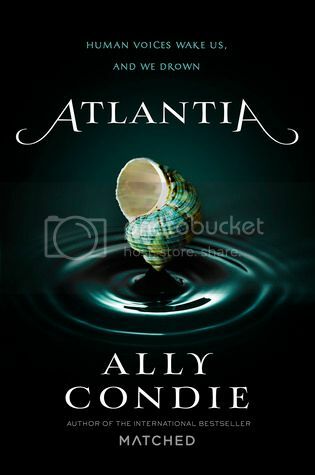 Atlantia is the first book that I’ve read by Ally Condie, although I’ve had her ‘Matched’ series on my to-read list for quite a while now. I jumped on a chance to review Atlantia, not only because I had heard great things about the author, but because the story sounded completely fascinating. I definitely was not disappointed. Rio has wanted nothing more her whole life than to live Above; to touch dirt, breathe fresh air, to see the sun in the sky. After her chance to go above is gone in an instant when her twin sister decides to go above instead, leaving Rio forever stranded below. Feeling abandoned by the only family she has left, and hiding a massive secret about herself, Rio devises a plan to join her sister once and for all in the Above. The characters in the novel were all very interesting, especially the main character, Rio. At times you couldn’t help but feel sorry for her, because she had pretty much been abandoned by everyone that she loved. But she was also really strong, and she never gave up on herself. I always find that admirable in a character. I love, love, love the family bond that Rio has not only with her sister, but especially with her mom. Also, her relationship with True was super cute. The storyline for the novel was very creative. While I can’t even imagine living in a world underwater, everything was described wonderfully and it all felt very realistic. The descriptions of the living environment in the Below were really well thought out, and very creative. I liked that the book kept me guessing as well; mostly why some characters did some of the things that they did. I needed to know why; it was so frustrating to be in the dark! I also really liked that this was a standalone novel, but I do did have a few questions after I closed the last page of the book. I don’t want to say that anything was left undone, I’m just curious as to what happened with a few things. Overall; I really enjoyed reading Atlantia, and I can’t believe that I waited so long to read something by this author! I’m definitely going to be reading more by Condie in the near future. I'm happy you enjoyed this one! I didn't really like Matched so I was hesitant about this book, but I'll think I'll give it a shot! I didn't know Ally Condie was soon to be releasing a new book! I have read her Matched series, and while I didn't like them much, I do want to give her a second chance and try out some more of her books. This one sounds good though, so this might the one that I like!